Hello! Spring is zooming by, the superbloom is fading, and I just got my summer seeds. We are currently in the process of turning our dirt dust bowl of a backyard into our dream garden oasis. Me and my husband have different design aesthetics (he's modern, I'm vintage, girly, pretty), so he designed a planter box area for my garden. Our last house I went crazy and it turned into a secret garden (but oh how I loved it)! With all that in mind, I needed a garden journal (at least I think I do hehe), to organize my design, what I want to plant, my seeds, and inspiration! Linen happens to be one of my favorite type of fabric to sew with and Riley Blake Designs has a beautiful collection of pretty linens in basic color ways. For my garden journal I wanted the linen to be the base and added vintage embellishments, and delicate hand quilting. I know I wanted a pocket of some sort for my seeds that I want to plant, so I created a row of seed pockets in the back. Basically, there is pockets galore in this journal! I machine quilted the inside and added a clear zippered pocket. Here is the back of the journal. I really wanted a row of pockets for my seeds and such. Here is the outside back pocket. Another way to hold seeds or journal bits. I hope you enjoyed my garden journal. Riley Blake Linen is lovely to work with, soft, yet sturdy, it's a great basic to add to your stash! RBD Linen is available now in an array of pretty colors, so check your local quilt shops or online. Hello and Yeehaw! I love boy fabric as much if not even more than girly, dainty, floral prints. 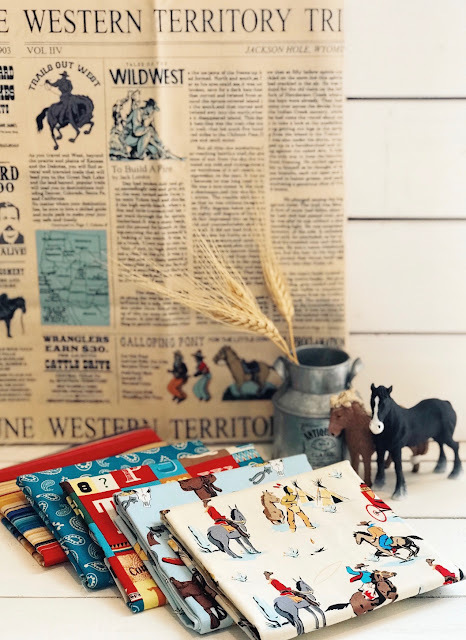 Cowboy Country by Carta Bella for Riley Blake Designs is so cute and boy boy boy! I made a bag (surprise hehe), but it's a bag for Jack or a diaper bag, toy bag, overnight, boy bag! It has the cutest prints of Cowboys, Indians, and Country vibes. I'm really trying to mix up Jack's love of cars and trucks so I started to slip in little toy horses, those little green cowboy/army plastic men, and farm animals, into his playtime. I guess I'm tired of stepping on hot wheels and little green cowboy/army men might be better for my feet hehe. I hope you enjoyed my Boy Bag. Cowboy Country is available now, so check your favorite fabric/quilt shop or online.